As you probably know I signed up to race the Outlaw triathlon and this race was my A race for 2013. 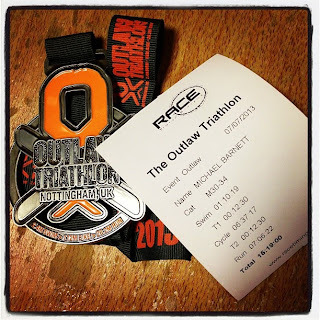 I have already blogged about the reasons for completing this race so early in my triathlon career. If you would like to recap on these reasons the blogposts can be found by clicking the links below. 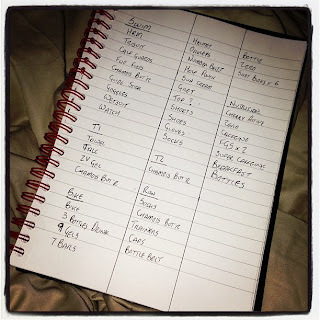 On Friday I packed for my trip to Nottingham and prepared a list of all the stuff I'd need. 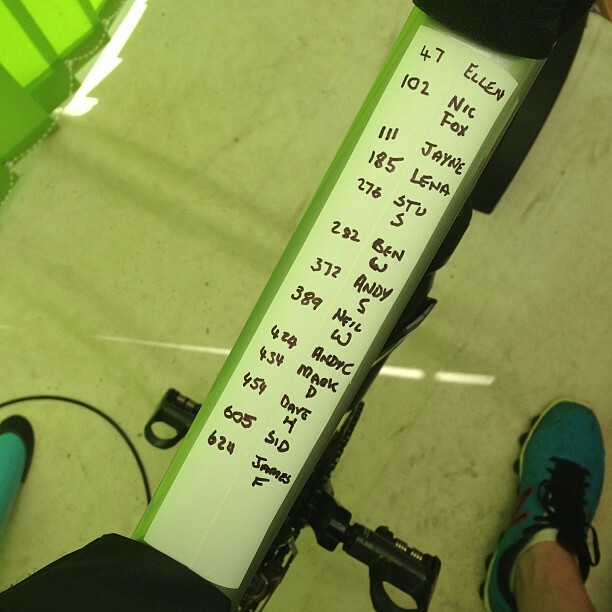 This list was remarkably similar to the on I did for Mallorca which means nothing was forgotten. 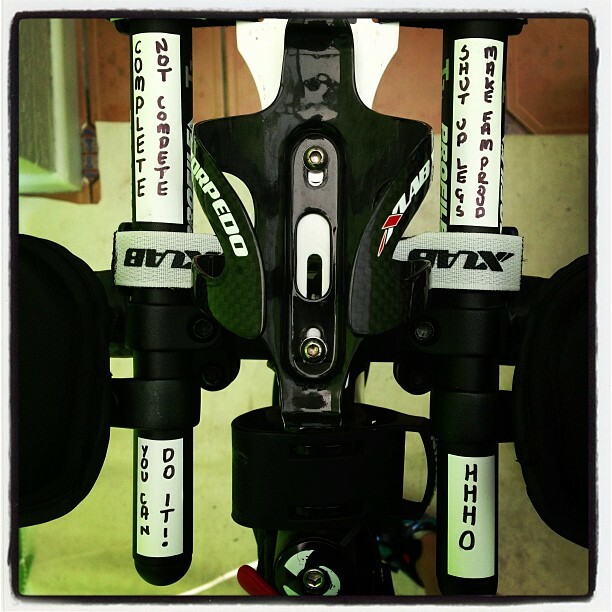 I also adorned my bike with mantras and competitor numbers of people from Twitter so I could say hello to people during the race. A lot of people liked this idea, some even borrowed it. #CompleteNotCompete - this has been my personal mantra since the outset of this quest and reminds me that I am only in this to get to the finish line. #ShutUpLegs - this was written on my bottle for Mallorca to get me up the climb and reminds me of my wife who wrote it on my bottle for Mallorca. #MakeFamProud - this is a reminder that I am making my family proud by completing this quest. I was going to have it as MakeMumProud in honour of my Mum but my family are just as important and my Dad, Sister, Niece and Wife came to support me. #YouCanDoIt - I entered this race because I can and no matter how dark my thoughts got on the bike this would remind me that I possess the heart and desire to get to the finish line. Myself and the Mrs travelled down to Nottingham on the Saturday so that I could register, rack my bike and transition bags and do some shopping. We arrived at the National Watersports Centre aka Holme Pierrepoint and I went to register. The registration process was very simple. After registration I went back to the car and unpacked the box from yesterday so I could repack things into their respective transition bag. 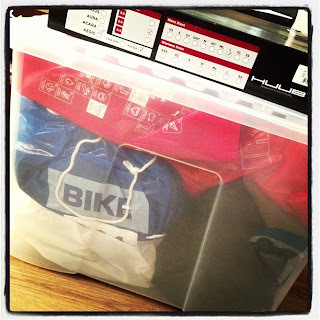 I always stress when packing for a triathlon as if you forget something for a triathlon it could be the end of your race so packing for a triathlon out of the back of my car in the middle of a field really caused me distress. I'll freely admit to being fairly unorganised in my life apart from when it comes to triathlon where I almost suffer OCD with my writing of lists. 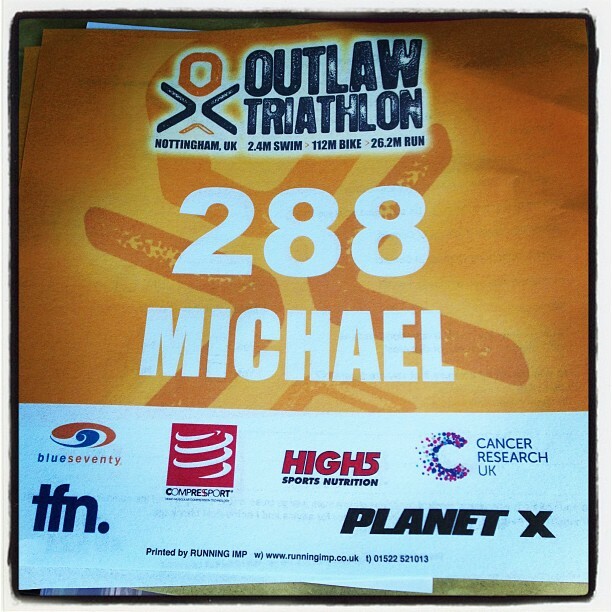 I then dropped my bags off in transition and made my way over to the Outlaw Expo. I love going to expos at triathlon as you can get some bargains. I'd decided I wanted a two piece triathlon suit to make going to the toilet in races easier. Now there was a decision to be made over the manufacturer. I'd narrowed it down to three in my head before the expo. 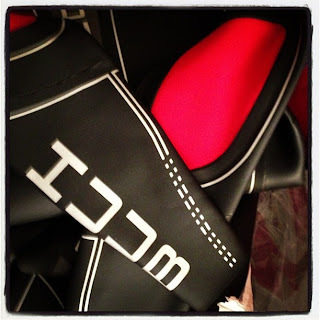 Huub as they make wonderful wetsuits and their trisuits are meant to be as good quality. 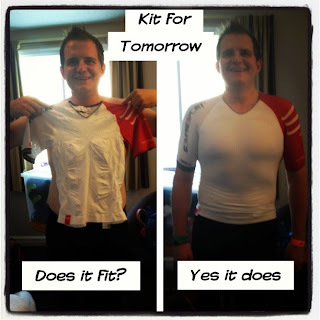 In previous tri's I have worn a trisuit and put other t shirts on top for the bike and run so ultimately I decided on the two piece from Compressport. I was really impressed with the top and shorts and also thought the compression would help my quads on longer runs. After I'd splurged on my new trisuit, we went to the hotel where I tried to relax. What a surpirse I couldn't really relax so instead rechecked everything I had to take tomorrow. I filled all my water bottles and put them in a bag for the morning. After tea I went to bed with the alarm set for 03:30 which would mean we could be at the venue for 04:30 which would give us loads of time. I woke up before my alarm went off at 03:00. I guess I was suffering with nerves which is understandable. I ate my breakfast and rechecked everything again! I then got dressed into my kit. Me and the Mrs were on the road by 04:00 and the first stop was McDonalds so she could get some brekkie and coffee. Except it wasn't because the 24 hour McDonalds wasn't open. Funny 24 hours if you ask me. We then set off for the venue. About 3 miles away from the venue I remembered that I hadn't picked up my nutrition bag. Cue blind panic as we went back to the hotel to get the bag which contained all my water bottles. This resulted in me getting to the venue later than envisaged and the next 45 minutes were a bit of a maelstrom of epic proportions. I went to the toilet, loaded my bike with bottles, pumped up my wheels, searched for my wife, put my wetsuit on, put my kit bag in the kit tent and left my gear with my wife and had a full 2 minutes to spare when I got into the water. Not the best of preparations but on the plus side I did manage to bump into a Twitfriend. I bumped into @Sidowski (who was attempting to complete Outlaw in a morphsuit to raise money for his niece), I gave him a good luck man hug which I'm not entirely sure he was comfortable with. The swim started at 6am and we were allowed in the water from 05:45 which was just as the sun was rising. What an amazing sight it was having the sun rise as you start a journey of 140.6 miles using your body as the engine. 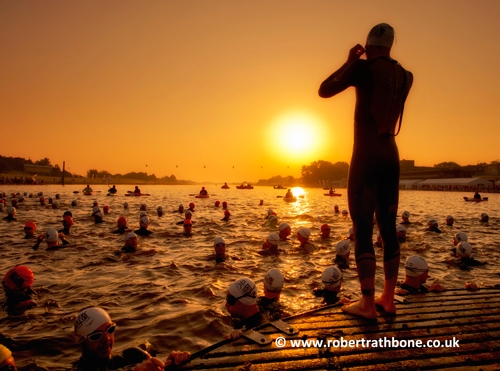 The photographer Robert Rathbone has allowed me to use his stunning photograph on my blog which depicts the beauty that greeted the athletes and spectators who witnessed the start. I opted to go in pen 2 and manoeuvred my way to the front of the group. This pen was for those swimmers aiming to complete the swim between 60 minutes and 75 minutes. The gun went off at 6am and we were underway. All 992 athletes / teams set off together. The mass start was a bit fighty. I didn't get punched but some people did. After about 200m I managed to find clear water, it involved me swimming close to the buoys but I don't swim well with other so clear water is preferable to having my feet touched. At one point I found myself swamped by other swimmers. A quick sprint soon sorted this out. I never really settled into my swim. I had hoped to be half way through the swim when my alarm signalling I had been in the water for 30 minutes went off. This would equate to a sub 1 hour swim. I hadn't even reached the turn though. Never mind. I knuckled down and got on with the job at hand. Left arm, right arm repeat countless times. When my alarm went off again after one hour I still hadn't reached the hut which was marked 500m. I picked out my sighting point and made my way to the volunteer on the far right of the exit pontoon. As I exited the water the clock read 01:10:19 and the volunteer unzipped my suit. 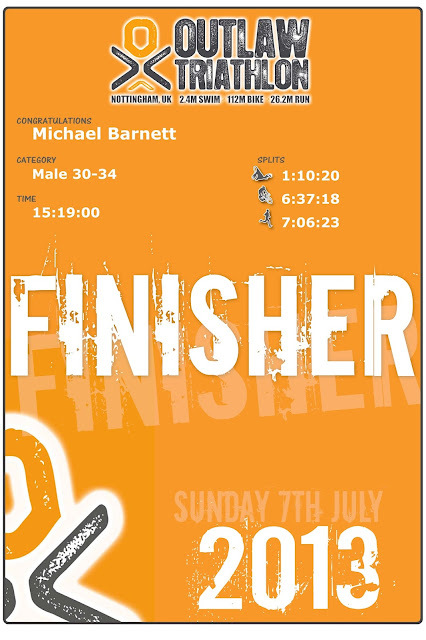 This swim was 251st quickest out of 922 athletes who completed the swim which was in the top 25% of all swimmers. I was over the moon with this considering I have only been swimming once per week. I had read somewhere that to safeguard goggles and prevent scratches pull them off your head and hold them in your hand while you remove your arm and the goggles get caught in the arm. This was a superb tip. After I'd stowed my goggles I slowed to remove my suit. For some reason this took longer than usual but it was a new suit. I entered the change tent and proceeded to well I don't know what I did but I spent 12 minute and 30 seconds in T1. I don't remember watching half an episode of The Simpsons but maybe I did, thats how much time I'd spent doing not a lot. I know I thoroughly applied suncream though which was necessary because of the heat. I saw another Twitfriend (@JayneMitchell22) as she was leaving T1. I shouted after her but she didn't hear me. I felt really good on the bike, the course was flat and there was no wind which plays more to my strengths than hills and headwinds. The course consisted of one 30 mile long Southern loop followed by a 34 mile long Northern loop and another lap of the Southern loop. I can honestly say I have never drunk so much whilst on the bike. I think I had over 4 litres to drink during the ride. I even had to stop for four toilet breaks. I applied suncream every time I stopped and realised that I had suffered wetsuit burn because suncream and friction burns do not mix very well. Ouch. I caught up with Jayne in the village of Car Colston and we had a little natter. I played a game of cat and mouse with another rider and each time we passed each the passer shouted out the next number. I think we got to 11. It's the little things that help keep you in a happy place on such a long ride. On the way back though the village of Car Colston there was a crowd of supporters and for one moment I got to appreciate what the riders in the Tour de France get to hear daily. Cow bells were rung, encouragement was received and it genuinely gave me a lift. The support along the bike route was immense. The feed stations were manned by triathletes who were helpful. It was really superbly run. I saw my family on my fourth visit to the the village of Car Colston and they got some pictures of me. Chasing down @JayneMitchell22 for another chat. 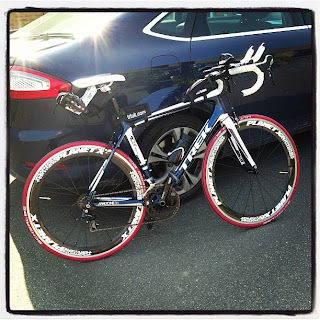 I started to struggle on the bike in the last 15 miles when I noticed that my pace slowed considerably. My pace fell from around 18mph to around 15 mph. The last 15 miles broke me mentally. The thought of getting off the bike was all that kept the pedals turning. My hips were starting to hurt at the Pirate feed stop at around 80 miles. It was there that a very nice Pirate told me that the run would be a welcome relief from the monotony of the bike. In that last 15 miles I knew what @Mousicles meant. Mousicles was really friendly and bike sat my bike while I went to the toilet and applied suncream to my neck, arms and face. the friendliness and advice is why I bloody love triathlon. It is the only sport I have known where each person shares the common goal and help each other along the way. The last 2 miles into Holme Pierrepoint were awful with gravel tracks and speed humps. Just what you need after over 110 miles of cycling. I got off the bike in a respectable time of 06:37 which meant my average speed was 16.8 mph. During the ride I set some new PB's for 50 miles on the bike and also this was the longest ride I have ever completed by some 27 miles. I got back to Holme Pierrepoint and dropped off my bike to one of the volunteers. I then jogged to the change tent and proceeded to watch another half episode of The Simpsons i.e. spend 12.5 minutes farting about. I only had to apply suncream, change my shoes and apply Chamois Butr to my feet. How did that take over 12 minutes. I know I cracked a joke about having 9 hours to run the marathon but this was just the worst procrastination ever known. I saw @TheBaldyGit leaving T2 and said hello. Well what can I say I only had 26.2 miles to go to get my shiny. Thats 42.2km or approximately 42200 steps. What could be so hard about that? Well as it turns out all 26.2 miles of the run was difficult in the oppressive 30 degree heat. I started jogging but couldn't settle into a rhythm and was soon walking. I felt a familiar niggle during the start of the run in my peroneal tendon but rulked it off. I then set up run walk alerts so that I could run for 3.5 minute periods before walking for 1 minute periods. This worked fine for most of the first 13 miles. I completed the first half of the marathon in just over 3 hours. During the first half of the marathon I bumped into two more Twitfriends @NicolaClareFox and @donendusted. We had brief chats and then went our separate ways The second half of the marathon however was a completely different story. My feet were in pieces. I was struggling to walk let alone run. It wasn't through blisters just general pain. At least that was a relief. 13 miles in and blister free. If you'd offered me this 4 weeks ago, I'd have bitten your hand off. So I can't really complain. I couldn't run but I could walk and if it took me 21100 painful steps I would get to the finish line. I still had just under 6 hours to complete 13 miles. So walk I did. I plodded for 2 hours and completed 7 miles before boredom set in. I argued with myself and decided to give running another go. I set my run/walk alerts again with periods of 3.5 minutes and 1.5 minutes. I was starting to make some real progress for all of one mile when something happened. I was passing an aid station where a woman was crying. I stopped and asked if she wanted company as she was on her own. We started to walk and I soon surmised that she was suffering from heatstroke because she was delirious and coudn't walk straight. During our walk to the next aid station, I managed to come across another person who was suffering from heatstroke. I had managed to pick up two waifs and strays and had now commited myself to ensuring their safety. I had seen so many people fall over and need medical help during the run that I couldn't just leave them. 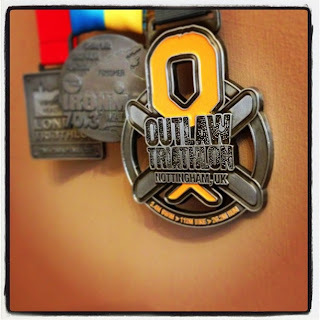 I walked them to the next aid station which had more staff than the previous one and in doing so I sacrificed my goal of completing the Outlaw in under 15 hours. It was only a goal I had formulated recently as the main goal was completion. But when I was running I was feeling okayish and believe I could have gone sub 15 had it not been for my good deed. After I had dropped them off at an aid station I set off run walking again. I had 3.9 miles to go and managed to run walk 2 miles of it. I bumped into my Wife and Dad with two miles to go and tried to continue run walking. I managed one more repetition before fatigue well and truly set in. It took me over 34 minutes to walk the last 1.8 miles but I kept moving forward and with each passing step got closer to the finish line. My family decided they wanted to cross the finish line with me. I had mixed feelings about this at the time but this was because I was in a dark place after racing for over 14 hours. In hindsight I'm glad they were there for me. I then collected my medal, finishers t shirt and bags and made my way to see my family. The total time was 15:19:00. Thats 55140 seconds of moving forward towards my goal. Was I pleased? I was elated. I can't describe the sense of pride I felt. Nine months ago I was a 20 a day smoker but on Sunday 7th July 2013 I completed one of the longest single day endurance events there is. I did this 50 weeks after completing my first triathlon and proved that a overweight ex smoker can do whatever he THEY sets his THEIR mind to providing he has THEY HAVE the heart, determination and desire to suceed. I'd like to thank each and everyone one of my blog readers and Twitter followers for the support I have received. My Wife for being patient with me during the hours of training I have undertaken. Is this quest over. In a word. No! There's lots more space on my medal hanger.